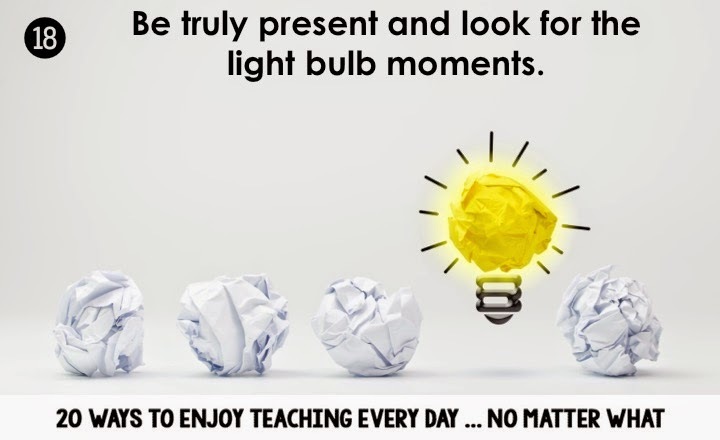 While reading through my chapter of Angela Watson's Unshakeable: 20 Ways to Enjoy Teaching ... No Matter What, I thought about how I chose this particular chapter for the book study because the title spoke to me - I always want to be present so I don't miss those light bulb moments in my students. But it didn't take more than a paragraph for me to realize the chapter is so much more than that - being truly present allows you to celebrate those moments with your students and realize them in yourself. I recognized myself right there in the first paragraph of chapter 18. Right away. That busy, stressed, multi-tasking teacher barraged by interruptions and getting annoyed. Yep, me. Me as a teacher and me as a parent. Those times when I slow down and let the "interruptions" take over and become teachable moments are so important - and I even recognize them when they happen. The problem is, I don't let them happen nearly enough. While reading this chapter I was reminded about the one little (BIG) area I still need to work on after 15 years teaching - control. Or rather, letting go of the control. I know I could feel so much better about every day if I just shook a little more of it off. When I'm not concerned about deadlines, data collections, standardized testing, that's when I'm more present with my students. And when I'm more present, the magic happens. Angela writes, "The end goal for a day of teaching can't be to "cover" a certain amount of curriculum; to cover means to obscure, and our goal is to illuminate. We must stay focused on illuminating the curriculum for students, and that can only be done by making a connection with them." And that's it - that's exactly it. I already know it ... but how do I get there? 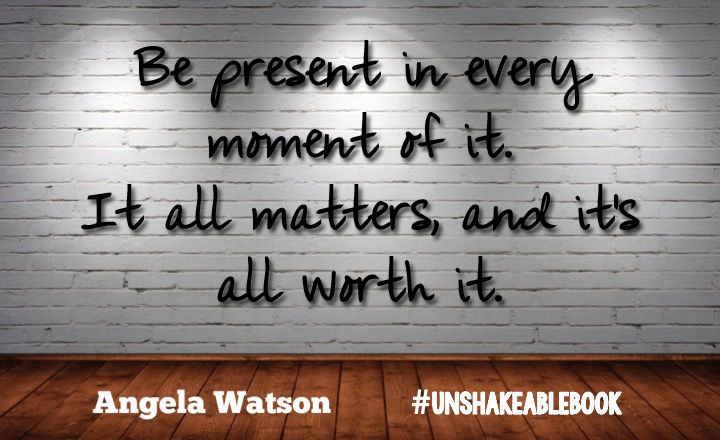 Being truly present allows you to see what YOU are doing - what YOU have accomplished. Really, truly, see it. 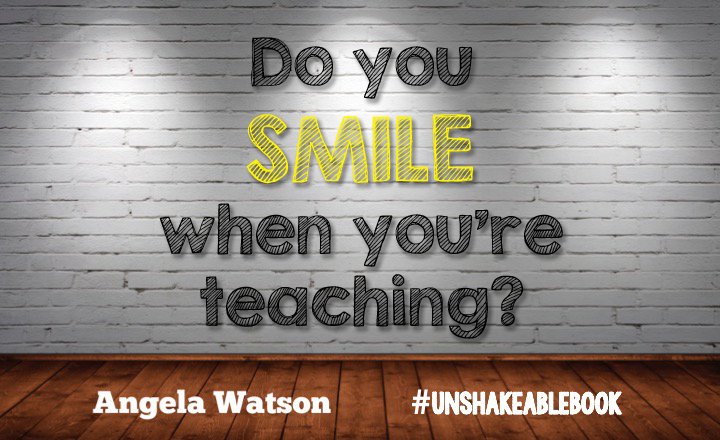 So, smile, be present, and remember that you enjoy teaching every day ... no matter what. 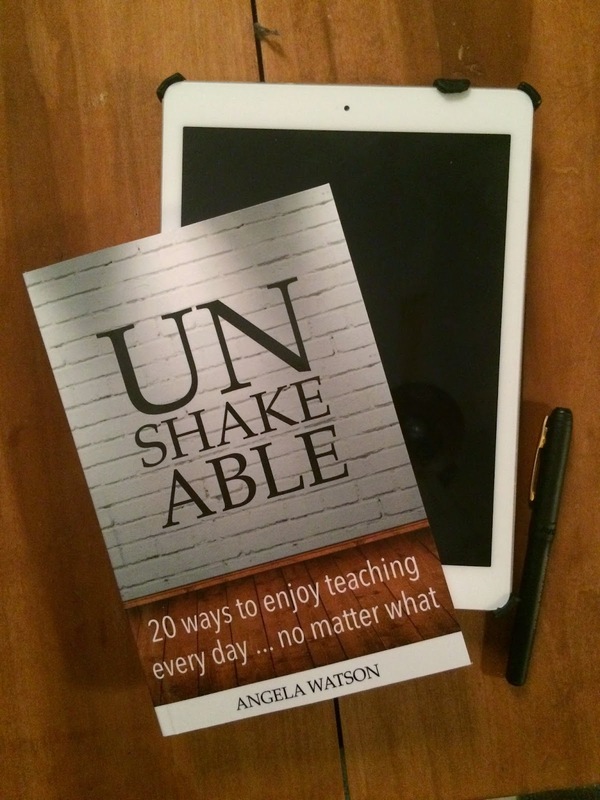 You can read a little bit more about Unshakesable and the messages behind the chapters in the book at Angela Watson's blog: The Cornerstone. It was EXACTLY what I needed to read at this time in the year. I love what you wrote here: "When I'm not concerned about deadlines, data collections, standardized testing, that's when I'm more present with my students. And when I'm more present, the magic happens." It's not easy to keep that perspective, but those moments of true presence and full engagement are what make teaching really worth it! Thanks so much for sharing your thoughts. Thanks for the reminders Jen! I have been feeling exactly the way you described for the past few years so this year I changed grades and made a conscious effort to focus on the kids themselves and leave the worry about testing, data, administrative tasks for only a small part of the day. I am much happier, more productive and a better Mom and family member at the end of the day too! I look forward to ordering and reading Angela's book. Sounds like something we could all benefit from. Such great advice! It's not always easy to be present in the now when we constantly are writing plans for the year/unit/week ahead. I appreciate the teachers and support staff at my school because the support is evident. The camaraderie amongst us is evident to our students as well. This benefits them because when working in a school focused on behavioral disorders, all the positive support helps!